This page provides a guide to using BioStor to find a reference. At its heart BioStor is an OpenURL resolver, wich you can use either from within bibliographic software and web sites, or through BioStor's web interface. You can use BioStor to find references from within EndNote and Zotero. If you use the Firefox web browser you could install the OpenURL Referrer add on, which will add the same functionality to sites that support support COinS, such as Mendeley. BioStor's OpenURL resolver provides a query form for entering the bibliographic details of the reference you are searching for. You can enter these details directly, or have BioStor parse the citation for you. If you paste a citation (such as the one below) and click on the Parse button, BioStor will attempt to parse it and, if successful, it will populate the bibliographic details form. 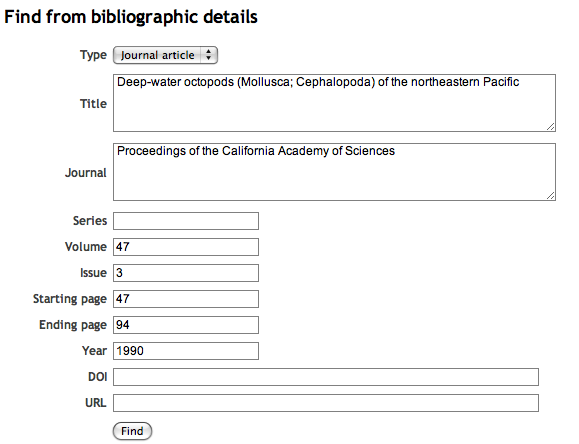 Voss, G. L. and W. G. Pearcy (1990) Deep-water octopods (Mollusca; Cephalopoda) of the northeastern Pacific. Proceedings of the California Academy of Sciences, 47(3): 47-94. If you click on the Find button, BioStor will search for the reference. The page displays one or more possible matches in the Biodiversity Heritage Library. If you have supplied the title of the reference you are looking for, BioStor will compute a "Title Score" based on how well the title matches the text on the corresponding page in the Biodiversity Heritage Library. A score of 1 is a perfect match. The search results also display a thumbnail of the Biodiversity Heritage Library page. You can click on the thumbnail to enlarge it. If you want to accept the match you must first fill in the CAPTCHA, then click on the Click here to accept this match button. BioStor will then load this reference into its database. Note that if BioStor hasn't encountered references from journal before, it may take some time to display the reference while it downloads the page images from BHL.